"I came up with this sandwich on my own. My husband wanted a plain grilled ham and cheese sandwich and I decided to experiment with some ingredients from the fridge. He absolutely loved it! Try using a chipotle mayonnaise to spice it up a bit." Sorry but we thought it was kind of bland. Very easy to throw together but I doubt I would make again. Try mixing basil pesto with the mayo. It makes for a delicious combination with the the provolone and red peppers. Awesome sandwich! I didn't have the red pepper, but I had everything else and it turned out AMAZING! Thank you so much for posting this. It was delicious. No question - this is a great sandwich! I couldn't find sourdough bread so I used ciabatta. It came out super!! DE-LISH! 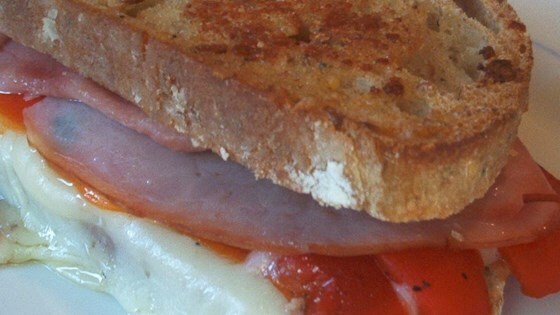 The red peppers take this sandwhich from boring to brilliant. I made mine on tomato basil bread and served it with soup. Does your husband know how lucky he is?